A cynic might dismiss this exuberance as merely the usual Wall Street cheerleading. After all, you can’t sell stock, ETFs and other financial products to investors when you are projecting a down market. And so they never do. Yet chalking these dubious targets off to salesmanship would be to underestimate the magnitude of the coming crash. The truth of the matter is that Wall Street gamblers have lived in the bubble for so long that they no longer grasp how artificial and unsustainable the entire financial system is. For the better part of three decades, the financial system in the U.S. has been expanding at nearly twice the rate of GDP. Even a basic familiarity with the laws of compound arithmetic reminds us that this ever-widening gap between economic output and the market value of stock and debt obligations can’t continue. The weakening performance of the U.S. economy during the last two decades did not warrant the drastic increase in the capitalization rate. In reality, equities and debt must ultimately be supported by interest and dividends extracted from national income (GDP). Historically, the stable U.S. financial capitalization rate — the combined value of debt and equity outstanding — had been about 2.0X national income. But beginning with Greenspan’s conversion to money printing after the financial meltdown of October 1987, the capitalization rate begin to steadily climb and never looked back. Now it amounts to nearly 5.4Xnational income. Yet this has occurred during a period when the trend growth rate of the U.S. economy has been cut in half — from more than 3.0% per annum to less than 1.3% during the eight years. 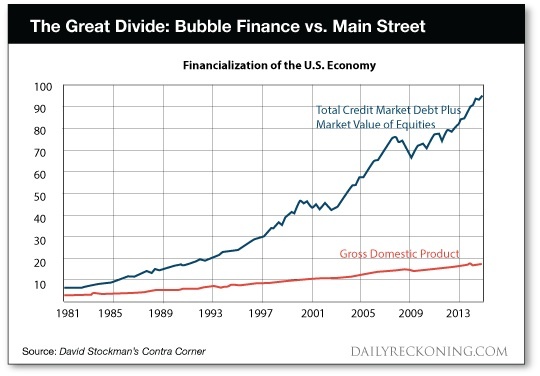 Measured in dollar totals, the sum of equity and debt outstanding in the U.S. in 1987 was $11trillion. Today it exceeds $93 trillion. 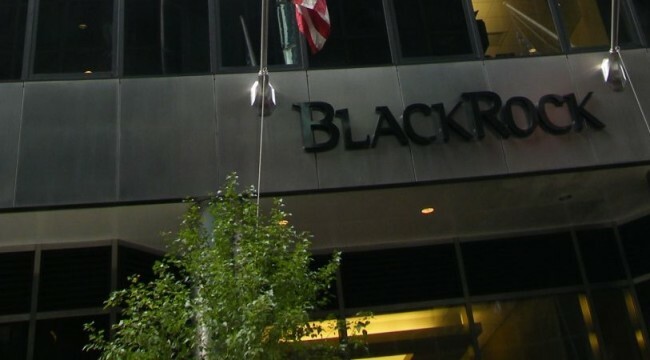 No wonder asset gatherers like Blackrock have exploded in scale! But that’s also why they are heading for a big fall. As the post-bubble epoch of global recession and financial deflation and liquidation unfolds, the $93 trillion U.S. financial bubble shown below will contract sharply. So will its equivalent worldwide total of $300 trillion. The number of these entities has grown from about 600 to 5,500 in the last 12 years, and assets under management (AUM) has exploded from $450 billion to $3 trillion. That’s a 21% compound rate of growth since 2005. Even more significantly, almost all of that growth occurred after the 2008 financial crisis. Prior to Greenspan’s dotcom bubble, ETFs did not even exist, and they would never thrive on an honest free market. That’s because their fundamental appeal is to professional speculators and traders and to homegamers who like to bet the financial ponies. By contrast, there is no reason why real long-term investors would want to own a huge, assorted basket of banking stocks or energy stocks. Or the likes of what’s in the biotech ETF portfolio. The latter (IBB) includes 150 different stocks, including nearly 100 start-ups whose science is extremely difficult to assess. Their profit and loss statements (P&Ls) are also largely non-existent. The sole purpose of the IBB was to enable speculators to pile on to the momentum trade in biotech stocks, which began about 2012. This momentum trend was then turbo-charged by the inflow of speculative capital into this sector through IBB and other ETF’s. The same thing happened with the energy ETFs. One of the major ETF baskets in this sector is called XLE and it includes 40 energy companies. These range from giant integrated producers like Exxon to refiners like Valero, to oilfield services companies like Halliburton, to small E&P companies like Newfield Exploration. The iShares equivalent is called IXC and it is even more diversified, with 96 companies spread among an even greater diversity of sizes, specializations and geographies. No long-term investor would possibly believe that such a hodgepodge of industries can be rationally analyzed at the company specific level. After all, the whole point of competitive markets is to sort out the winners, losers at the sector, industry and sub-industry level. So buying the entire industry in a single stock amounts to embracing self-cancelling financial noise. That undoes all the hard work Mr. Market performs at the operating performance level. Exchange traded funds, at bottom, are products of the financial casinos, not the free market.They offer traders and speculators the chance to “bet on black” for just hours, days or weeks at a time, based on little more than headlines and momentum. Not surprisingly, the XLE has now completed a round trip to nowhere during the last five years as the oil bubble re-erupted and then collapsed. The massive amount of trading that occurred continuously up and down along this trip to nowhere was economically pointless. It was a playpen for speculators and robo-machines. It didn’t allocate capital efficiently or add market liquidity to the real enterprise of American capitalism. The implication is straightforward. The ETF boom functioned as a market acceleratoron the way up. Speculative capital poured into these proliferating funds, and then was transformed by Wall Street market makers into demand for the thousands of individual stocks that comprise them. This magnifying effect is important to understand because it highlights the artificiality and instability of today’s stock markets. Every time an ETF started trading above the net asset value of the underlying stocks due to speculator buying, fund providers issued new ETF shares to market makers. These market makers, in turn, bought up a basket of shares on the stock exchanges representing the asset mix of the fund. They then swapped them for the ETF shares. The reason is straightforward. The $3 trillion world of ETFs is not an investor marketplace. It is a casino where the fast money moves in and out of short term rips, bubbles and flavors of the moment; and also a dangerous place where naïve retail investors have been lured to roll the dice on their home trading stations. So as the global economy and financial markets slide into the long, deflationary cycle ahead, the hot money will flee sinking ETFs at an accelerating pace. Homegamers will be shocked to find that they have been fleeced by Wall Street yet again. At length, retail level panic will ensue, causing a thundering implosion of the ETF sector. This means that retail investors may be faced with painful episodes in which ETF shares gap down violently to deep discountsrelative to their net asset value. Accordingly, if shareholders have attempted to protect their portfolios with stop orders, they may be handed sharp losses. Or they may just panic and sell. Moreover, during this trial panic, the risk of large pricing gaps was painfully evident. The Vanguard consumer staples ETF called VDC, for example, plunged by32% that day while the underlying holdings of the fund dropped by only 9%. Retail investors who panicked or who were sold out by stop loss orders were taken to the cleaners by the market makers. Instead, the implication is that after a few more such episodes during this unfolding bear market — which must inexorably happen due to the liquidity mismatch — retail investors will become thoroughly disgusted with ETFs. They will then head for the hills right behind the fast money on Wall Street. Setting ablaze more than $1 trillion of ordinary investors’ money. You’ll want to make sure you’re not one of the victims. That’s why I’m hosting a FREE live event next Wednesday at 7 p.m. EST to give you all the details. Click here now to reserve your spot. But hurry. These events fill up fast. So sign up today.